Well, they did it. They finally did it. After years of dissapointment and countless campaigns, it's finally happening. Star Wars Battlefront III is going to be on your gaming consoles in the near future. At this point, all we see is a man of unknown origin walking through a barren battlefield covered in snow. A snowspeeder whizzes past as an AT-AT steps in front, barely crushing the character. Combining stunning visuals, incisive gameplay, and smart level design, the Star Wars: Battlefront video games took fans into the Star Wars universe in previously unexplored ways. 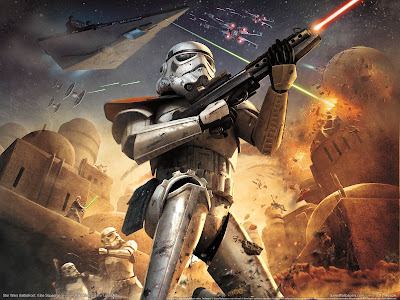 The series beautifully showcased Star Wars locales, featured intense ground-battle action, and allowed gamers to fight for the Empire, the Republic, the Rebellion, and other factions. They were not just great Star Wars games; they were great video games in their own right. And we are thrilled to confirm that the series will continue. In their pre-E3 press conference today, Electronic Arts Inc. announced the production of a new entry in the Star Wars: Battlefront franchise, currently titled Star Wars: Battlefront. It is being developed by DICE, creators of the critically-acclaimed Battlefield games, and will utilize the Frostbite 3 engine. As one of the world’s premier video game developers, DICE has the talent and expertise to deliver a Star Wars experience like no other, while pushing the boundaries of what is capable in a video game. TheStar Wars: Battlefront series, which we know means so much to fans and gamers, is in good hands. Assuming that the deal was only recently struck, the game can't be that far into development, which would explain the short teaser. At this time, very little information is known, and no release date has been set.